From the latest Editorial in the Washington Times: The list of problems central to the global warming fraud just doesn't seem to end. As if hiding and losing data, the numerous errors in the U.N. Intergovernmental Panel on Climate Change and the suppression of academic research that disagrees with global warming weren't bad enough, now comes word that basic ground-based temperature data may have been biased towards incorrectly showing temperature increases. 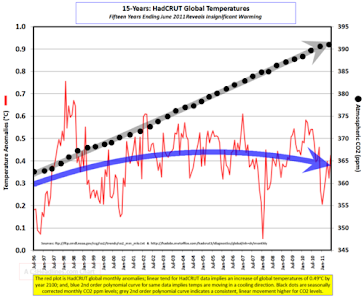 The Global Warming edifice rests on the "so-called warming " shown in the temperature data sets which have been "adjusted " continually , always to give a greater warming signal. Mr. D'Aleo and Mr. Watts provide some amazing graphs showing that the jumps in measured global temperature occurred just when the number of weather stations was cut. But there is another bias that this change to more urban stations also exacerbates. Recorded temperatures in more urban areas rise over time simply because more densely populated areas produce more heat. Combining the greater share of weather stations in more urban areas over time with this urban heat effect also tends to increase the rate that recorded temperatures tend to rise over time. The crux of the matter is that fanatics about man-made global warming want to spend trillions of dollars based on conclusions from faulty data. 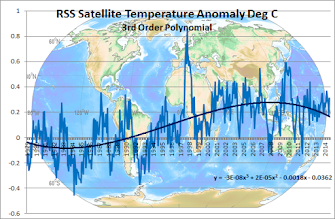 So the "rest of the science is solid" mantra of the Warmists is crumbling as the temperature data is analysed. Scientists 'not clear' on Climate . Skeptics LIGHT UP For "Earth Hour"
ABC's Tony Jones Should Be Sacked! Muslim Elders Say Penalties Are Harsh. Will Roses Smell Sweeter in a Warming World? NASA - Cooking the Books in Queensland. Lambert - Lamb to the Slaughter. Cameron Should Heed What Happened to Turnbull. Way To Go , Jo!